There's very little in a band's biography that will alter my perception of their album prior to giving it a good listen, but I have to admit that I wasn't quite prepared for the information that accompanied Runic's new album Liar Flags. Apart from the fact that the band consists of a whopping seven members (Vocalist Juan, lead guitarist Jose, rhythm guitarist IvÃ¡n, bassist David, keyboardist Eneas, bagpipe player Fran (Who is also a member of Templario) and drummer Rivas), and that they play a hybrid mix of Viking, Pagan, folk and black metal, what makes Runic so different is the fact that they're from Spain, and who for reasons unknown happen to be taking on a genre of music that is generally and traditionally exclusive to Scandinavians. What's even more surprising is that Runic manage to actually sound convincing. On Liar Flags (The follow up to their 2001 six-track E.P. Awaiting The Sound Of The Unavoidable, which was released through Indar Productions), the CastellÃ³n based act actually manage to rival their European counterparts with all of the nine tracks featured on the album sounding interesting, well produced and diverse. Starting out with an assortment of percussive instruments, it isn't long before the guitars are picked up for opening track ...When The Demons Ride. Throughout its six minute running length, all the above mentioned genres appear in one form or another, but without sounding like a mess at any point as the keyboards, vocal and strong sense of melodies keep the track ever flowing and memorable at all times. The title track Liar Flags follows along the same path as the opener, while the two part Last Days Of Aghrapur is by far the most impressive pair of songs the album has to offer, with Pt. I. Ambush allowing the guitarists to really stretch their progressive lead breaks without restraints, while Pt. II. Lost Empire shows a greater leaning towards the symphonic and bombastic. Predecessor and Vs Myself are perhaps the album's fastest tracks, and the two examples of where the band get as close to traditional melodic black metal as their bio proclaims, while To The Fallen Ones is spiced up with the addition of female vocals throughout. Returning to folk/Pagan metal territory, Nau features a wide variety of percussive instruments and chanting backing vocals, while the short instrumental And A New Journey Begins... finishes things off once again in symphonic style. 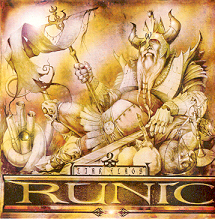 Purists will no doubt scoff at the mere mention of a Spanish act like Runic trying their hand at Viking, Pagan, folk and black metal, but I would be the first to admit that if I didn't know where Runic hailed from, I would have assumed Europe. But even with the knowledge I now possess, I have to admit that Runic's debut is damn impressive, if a little unconventional in regards to their origin and what is generally regarded as tradition within metal.